The Royal Canadian Air Force operated it’s own sub-variant of the F-104 Starfighter, the CF-104, of which 200 were built. Made by Canadair the CF version was very similar to the G model in use with many European airforces. It had a different radar specialised in air to ground operations and it had the ability to carry a Canada specific camera pod called the “Vinten Pod”. 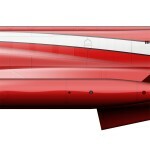 Originally tasked with the nuclear strike mission the RCAF 104’s role shifted to conventional strike mission in the later years of the aircrafts service. While the CF-104’s were delivered from the factory without cannon armament the American designed M61A1 gatling gun was installed as in most European 104’s as well as added ECM equipment. Antennae for these countermeasures under the nose and on both sides of the rear empennage are on the most distinguishing features of the CF-104. 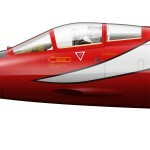 In 1983 the Canadian 421 Squadron painted CF-104 104805 in a bright red paintscheme to celebrate the 30th anniversary of CFB Baden-Söllingen in Germany and also the squadrons 40th anniversary. 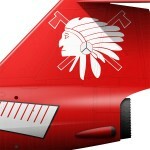 It has a prominent Indian motive along with a arrow that runs the length of the fuselage. This marking soon earned it the nickname “The Toothbrush”. The Canadian presence at Baden-Söllingen would continue well after the Starfighter left the base, the curtain finally fell for CFB Baden-Söllingen in 1993. Nowadays it is a commercial airport serving the Karlsruhe area. CF-104 104805 ended its career in 1985 when it became a training aid, it’s parts being used for other aircraft in a process called “cannibalisation”.